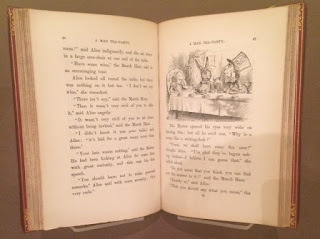 Today the Secret Victorianist fell down the rabbit hole at the Morgan Library & Museum in New York, visiting their special exhibition on the publication history of Lewis Carroll’s Alice’s Adventures in Wonderland (1865), one of the most loved and enduringly popular novels in the English language. 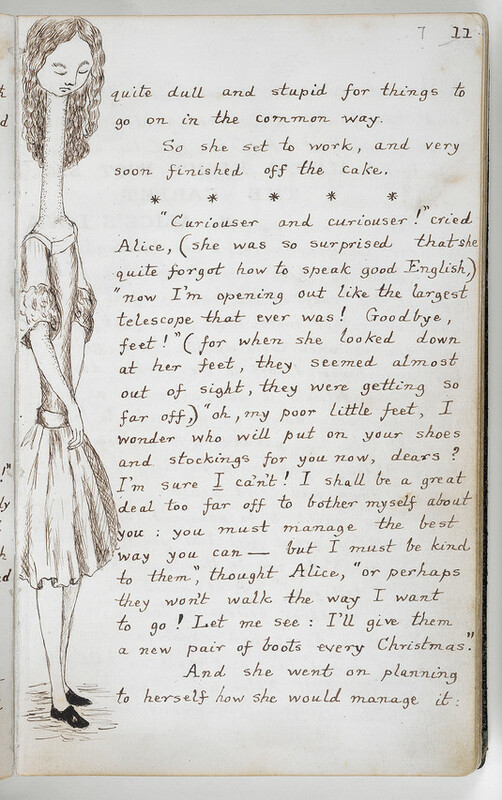 At the heart of the retrospective is a unique exhibit (on loan from the British Library) – the manuscript of Alice’s Adventures Under Ground that Dodgson (Carroll) gave to Alice Liddell (the inspiration for Alice) in 1864. This manuscript does not include some incidents that were to become central to Wonderland as we know it (for instance, the duchess whose baby is transformed into a pig), so is especially valuable in demonstrating the evolution of the text from an extempore oral narrative composed on a sunny day in Oxford to a published novel. 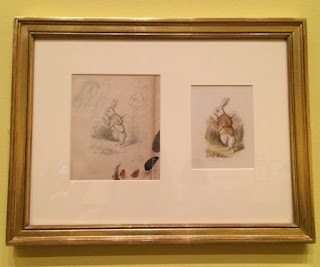 The manuscript also contains Carroll’s original illustrations, before he turned to the talents of Punch cartoonist John Tenniel for his now iconic renderings of Alice. The exhibition does a good job of interesting visitors in questions of bibliography – no doubt largely because of the highly visual focus. 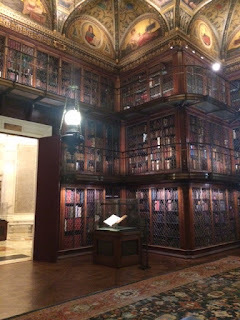 The illustrations, in various levels of completion, and from several different hands, serve as a beautiful guide to the evolution of a book – they alone tell the story how a tale born from the imagination of one man or a woman will be transformed by the influencers it meets on its journey to publication and beyond. Along with illustrations, early print editions, and the Under Ground manuscript, the exhibition also puts on show: personal items belonging to Alice Liddell at the time of the story’s conception, Dodgson’s correspondence pertaining to the publication of the text, other children’s books originating from the period, and some pieces of contemporary Alice-themed ephemera (my favourite was a Wonderland-styled biscuit tin). They also displayed scenes from the novel’s first film adaptation, in 1903 (inserted here). The exhibition title had led me to think there might have been a greater emphasis on the text’s reception history further into the twentieth and the twenty-first centuries, but, while this is rich territory for discussion, (perhaps appropriately) it is not the focus at the Morgan. 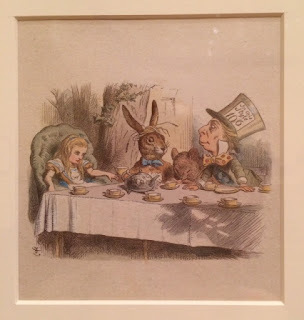 The early years of Wonderland give a fascinating glimpse into the publishing landscape of the mid-nineteenth century, appealing to any book-lover. 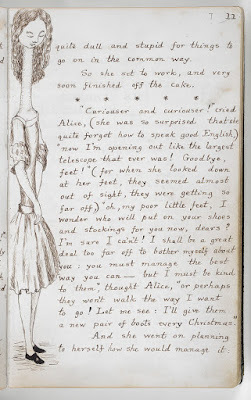 So visit to discover how Carroll’s Alice was realised and became a milestone in children’s publishing, or for an accessible introduction to the study of bibliography. 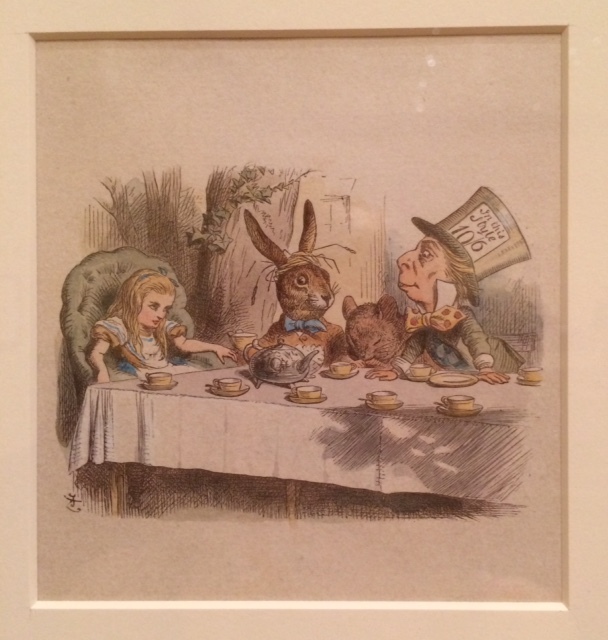 Alice: 150 Years of Wonderland is running until 11th October 2015 at the Morgan Library and Museum. Entrance to the museum is $19 for adults. Do you know of any other NYC exhibitions you think the Secret Victorianist should review? Let me know – here, on Facebook, on Google+, or by tweeting @SVictorianist! This week, the Secret Victorianist was in San Francisco and took the opportunity to see J.M.W. 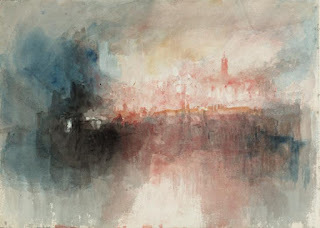 Turner: Painting Set Free, the first major survey of nineteenth-century painter Turner’s late works (1835-1850), which is currently on view at the De Young museum in the city. The exhibition was originally on show at the Tate Britain in London and was at the J. Paul Getty Museum in Los Angeles earlier in the year. Known for his unrivalled and extraordinary use of light and colour, Turner (1771-1851) was a leading, and controversial, artist in his day. His late works demonstrate his continued inventiveness, as he takes mythical and biblical incidents as subjects for artistic experimentation. Take his Mercury and Argus (pre-1836). Rather than as a hundred-eyed guard, Argus is represented as a small indistinct figure and Mercury has few of his usual visual signifiers. Meanwhile, only the small bell around Io’s neck sets her apart from her fellow cattle. For Turner, the idealised pastoral landscape is of greater interest than the mythic plot, although this scene’s bloody aftermath, if recalled, creates a keen point of imaginative contrast. The placement of the beam of light is also more than an excuse to experiment with the play of light. 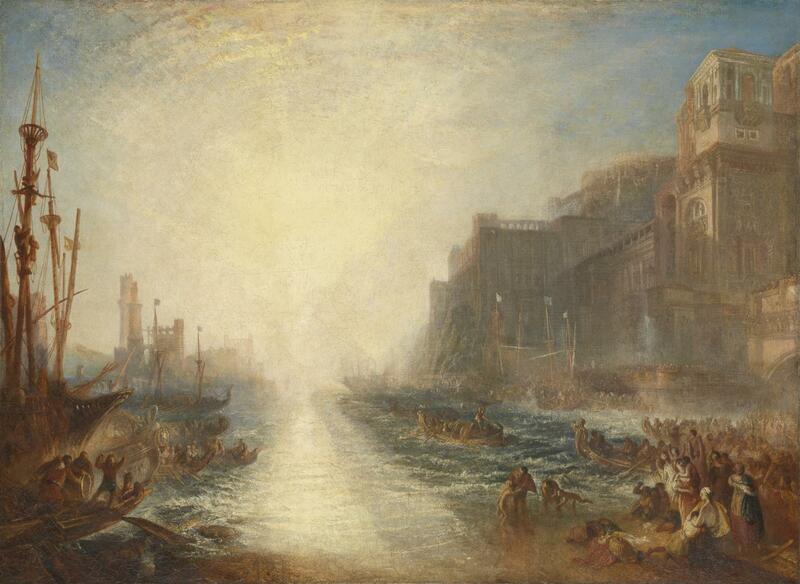 The sun suggests Zeus – the original reason for Io’s transformation. 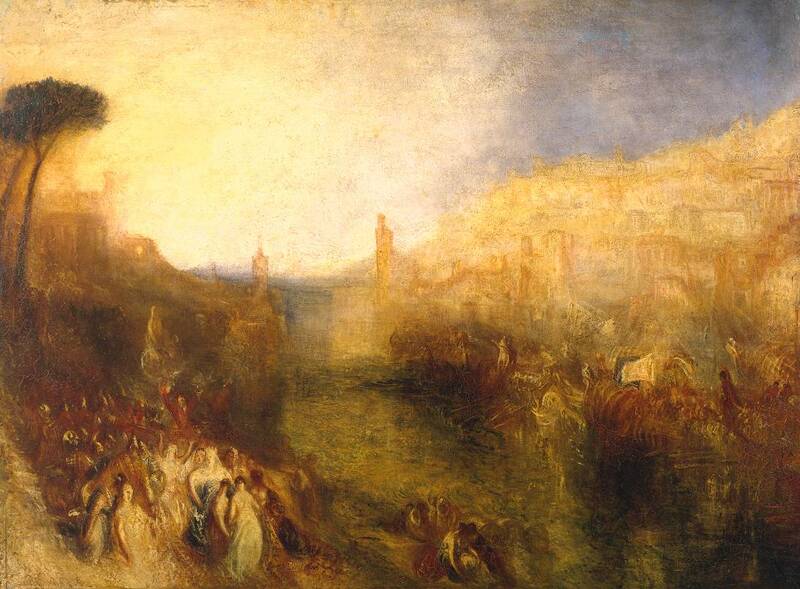 In Regulus (reworked 1837), it is unclear which of the figures is the doomed Roman general preparing to return to Carthage. Yet the blinding sun directly references the fate that will meet him there. Similarly, in The Departure of the Fleet (one of the four scenes from Virgil’s Aeneid Turner displayed at his final Royal Academy exhibition in 1850), the figures representing Dido and Aeneas are unimportant – the focus is on the setting sun marking the end of their relationship and how it touches the city the Trojans are leaving behind, soon to be illuminated likewise by its queen’s pyre. 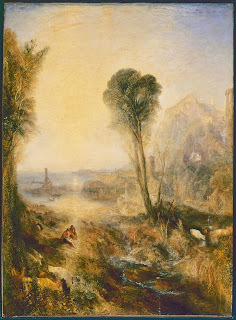 The exhibition also draws attention to Turner’s unusual working habits – his hasty watercolours Fire at the Grand Storehouse of the Tower of London, painted in 1841 as the fire raged, the significant changes he made to works during ‘Varnishing Days’ at the Royal Academy when other artists were only making the minutest of alterations to their paintings. 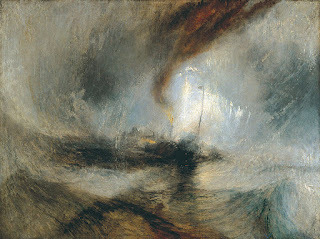 There is no greater apocryphal story demonstrating Turner’s commitment to his work than that attached to Snow Storm: Steam-Boat off a Harbour’s Mouth (1841). Turner, then 67, claimed he was tied to the mast of the boat better to understand and capture the essence of a nocturnal storm. 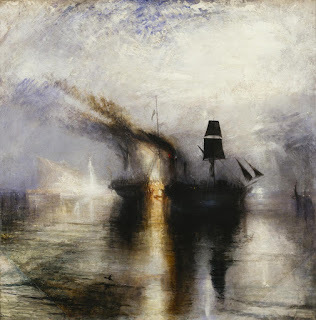 The scale and quality of the exhibition is incredible and leaving Turner’s world behind can be a little stepping back outside into a light of a disappointing and less brilliant sun. J.M.W. Turner: Painting Set Free is on display at the De Young Museum in San Francisco until September 20th - tickets for adults cost $20. Do you know any art exhibitions back in New York you think the Secret Victorianist might enjoy? Let me know – here, on Facebook, on Google+, or by tweeting @SVictorianist. Of smile, and of speech. Last weekend, I made my first visit to Green-Wood Cemetery in Brooklyn. Founded in 1838, the burial ground sprawls across nearly 500 acres and houses extravagant monuments and mausoleums dating from the nineteenth-century. Before the foundation of Prospect Park in 1869, the cemetery was Brooklyn’s main green space and was used as such, as well as for internments. It was also one of New York’s premier tourist attractions, due to the dignitaries and notable men and women buried there. Yet today it feels largely deserted. I saw only a handful of walkers when exploring the cemetery, despite its beautifully manicured paths and lawns. Without a doubt one of the most beautiful places I’ve visited in New York, I’ll definitely be back – to walk (there are even some hills there! ), to enjoy the peaceful atmosphere, and to read and investigate the names on the older gravestones. Alice (1820-1871) and Phoebe (1824-1871) Cary: Sisters from Ohio, poets Alice and Phoebe enjoyed some celebrity from the late 1830s, when their teenage writings were published in newspapers, and become even more prominent after 1849 with the appearance of a joint collection of poetry. Key figures in the New York literary scene up until their deaths, they died within five months of each other and are buried side by side in the cemetery. Elizabeth F. Ellet (1818-1877): Elizabeth Ellet (nee Lummis) was a New York-born writer, best known for her involvement in a scandal concerning Edgar Allen Poe and Frances Sargent Osgood in the mid 1840s. 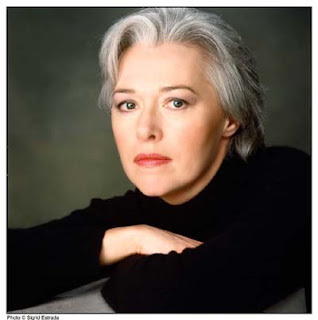 Her major works include a tragedy, Teresa Contarini (1835), which was performed on the New York stage, and The Women of the American Revolution (1845) – the first work to document the role of women in the American Revolution. Laura Jean Libbey (1862-1924): Libbey was an extremely popular writer of ‘dime novels’ (similar to modern day romance fiction). I’m sorely tempted to give one a read based on some of the titles alone! They include Daisy Brooks, or A Perilous Love (1883), Pretty Madcap Dorothy, or How She Won a Lover (1891), Jolly Sally Pendleton, or The Wife who was not a Wife (1897), Mischievous Maid Faynie (1899). What other attractions would you recommend to a Victorianist in Brooklyn? Let me know – here, on Facebook, on Google+, or by tweeting @SVictorianist. Next up in my very modern series is a book that isn’t Neo-Victorian at all, but rather neo-nineteenth-century. Susanna Clarke’s magical odyssey spans the years 1806-1817, as her unlikely pair of magicians help defeat Napoleon, squabble via rival periodicals, and accidentally inflict perpetual night on swathes on Austrian-ruled Venice. Despite its early setting, I wanted to include the novel in my Neo-Victorian round-up not only due to its high quality and current popularity (given the 2015 BBC adaptation), but because, in tone, plot and structure, it stands apart from many other historical novels (and novels more generally), making it an interesting counterpoint to some of the novels I’ve previously blogged about. 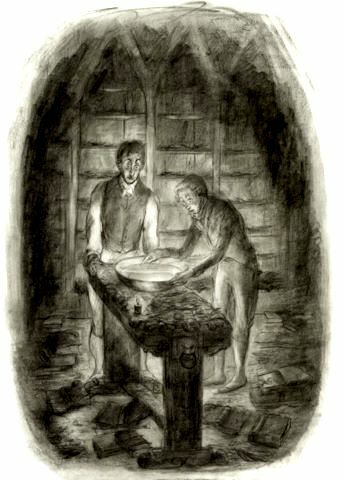 Rather than trading on plot devices familiar to lovers of nineteenth-century novels (as we saw in Michael Cox’s The Meaning of Night, or even more directly, due to its intertextual interests, in John Harding’s Florence and Giles), Jonathan Strange and Mr Norrell continually defies readerly expectations. Clarke’s English magicians are capable of transporting whole cities to different continents and disappearing through mirrors, and at times it feels as if she herself is achieving something similar, as the novel lurches madly but masterfully between locations, subplots and consciences. If some of the Neo-Victorian writers I’ve looked at so far can seem to go a bit heavy on proving the historical verisimilitude of their texts, their literary antecedents, and their academic leanings, Clarke’s novel reads as something of a witty rebuke. Here too there are footnotes, and a deep consciousness of the novel as text, but their content is an extended joke. Clarke has created an entire academic discipline of Theoretical Magic, complete with a cast of nineteenth-century, and earlier, scholars, canonical texts with which the reader becomes increasingly familiar, and vicious intellectual debates. What’s most clever is how this ‘history’ intersects with a history of England (and particularly the North of England) made more magical. The longer you read (there are more than 1000 pages in all) the harder it becomes to distinguish between history and fantasy, as if you were trying to traverse one of Norrell’s labyrinths. 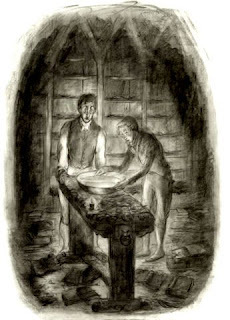 If in some ways Jonathan Strange and Mr Norrell is a very different kind of novel, in others, however, it bears all the hallmarks of its literary antecedents. In style, Clarke attempts a blend of Dickensian characterisation and caricature with a rye social humour most comparable with Jane Austen. The execution is a little uneven (and works better in passages exempt from references to magic), but means that there are points at which the novel fills less like a fantasy tome and more like a social comedy. Overall, the novel is a light, but long, entertainment, designed to delight academics and the well-read, complete with cameos from the likes of Byron and Lord Wellington, and using the past as a foreign country where even the magical becomes strangely plausible. Don’t expect emotional depths, a literary response to the literary canon, or a Victorian preoccupation with the human condition and morality. Neo-nineteenth-centuryism is, for Clarke, a device for creating her very own breed of magic realism. What novel should the Secret Victorianist read next in her Neo-Victorian Voices series? Let me know – here, on Facebook, on Google+, or by tweeting @SVictorianist!